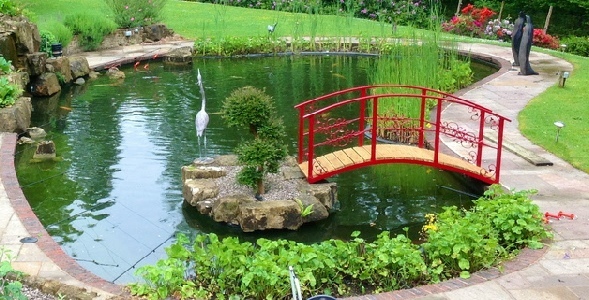 In the design of bridges for gardens, proportion and scale are the most important factors. 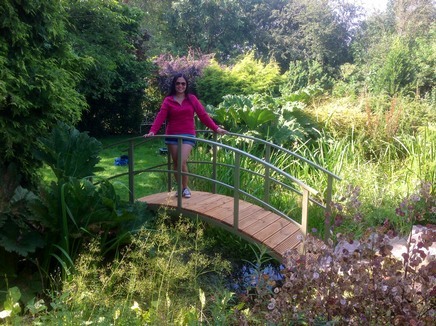 The bridge sides, if too high, will make the bridge appear visually dominant in the average garden. I have found from experience that making the bridges around 32 inches high is ideal, giving a comfortably functional handrail. 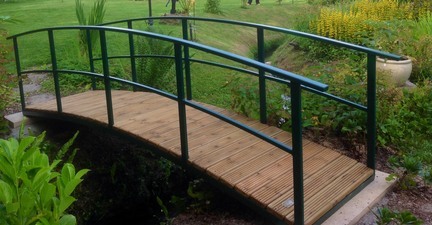 I have built bridges only 18ins high when scale was more important than a functional handrail(see the photo opposite). I have also built bridges 3ft high for tall people. Please contact me to discuss this or other issues. My aim is to create a structure which enhances the garden and sits gracefully in it. I offer several bridge designs. My most popular design is the Monet which has an enduring understated appeal which sits comfortably in any garden. The next most popular design is the Japanese. Probably only about 30% of the Japanese bridges I build are for dedicated Japanese gardens. I also build bridges which have more ornate metalwork. The most popular of these is the Berriew, which has a shallow arc determined by the differing diameter circles at either end. The Berriew is a good option for a ride on mower. My latest design option of the Berriew is ideal for child safety as there are no large gaps in the metalwork. This Japanese bridge at Sidmouth is only 18 ins high but is proportionate in it’s setting. 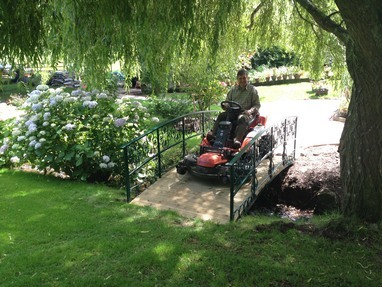 My standard bridge width is 36 ins which gives easy crossing access with a wheelbarrow, but this Berriew bridge is wider to accommodate a ride on mower. The two photos to the left show the options for varying the arc of the bridge. The upper photo shows a Monet bridge in Dorset with a shallow arc, when ease of pedestrian access was the paramount concern. The photo below shows a Monet bridge at Belton when the aesthetics of a graceful arc was the preferred option. A steeper arc creates a beautiful reflection in the water. 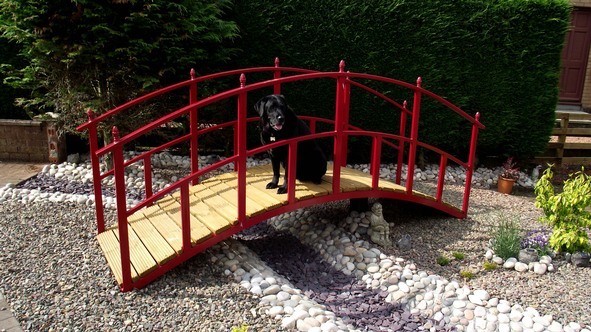 Choosing the colour of your bridge is important and can create a focal point (such as a traditional red coloured Japanese bridge) or complement the surrounding planting or garden furniture. Black or dark green are popular and safe options, but customers who have been more adventurous can be rewarded for their enterprise. Shropshire Galvanizers powder coat in any RAL colour number but make a surcharge of £50 if your choice is not one of their stock colours. This green Japanese bridge in Lincolnshire gives access to an island with a George Bernard Shaw type revolving summerhouse. This Monet bridge at Belton is powder coated in Reed Green and matches the pergolas and other garden furniture and the window frames of the house. 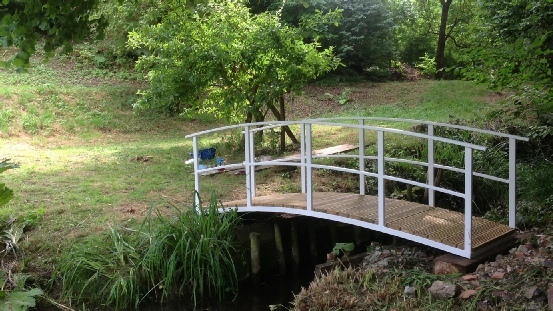 This white Monet bridge near Petworth with a shallow arc is owned by the superb artist Richard Davidson. To see Richard’s website click here. 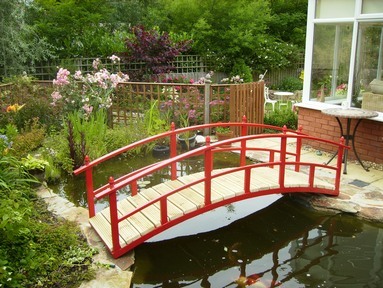 This deep red Burgedin bridge near Haslemere matches the Rhododendron planting around the pond. 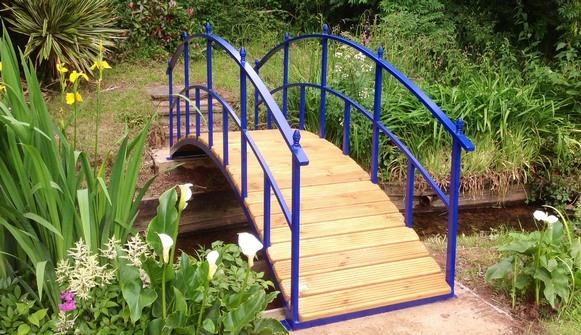 This Japanese bridge near Exeter was powder coated in ultramarine and looks stunning. There is a garden seat nearby which is also coloured blue and the iris, lillies and astilbes create a striking contrast. A bridge doesn’t have to cross water to look attractive. My customer in Midlothian has made a delightful dry pebble stream as a feature for this bridge. 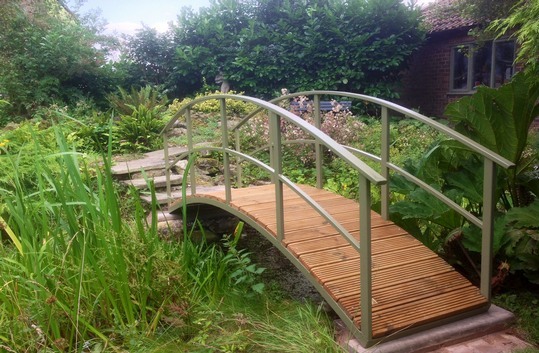 I build galvanized and powder coated metal garden bridges. I offer designs from minimalist to ornate including Monet and Japanese designs.